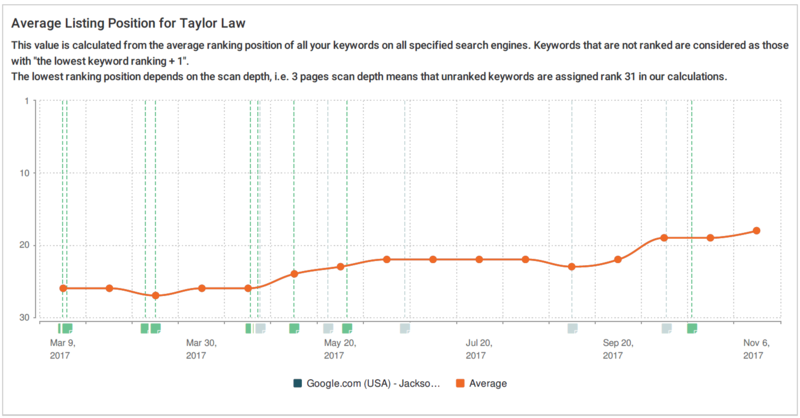 A few months after building his website Chris Taylor of the Taylor Law Office came to use to help increase his SEO rankings. Chris had done a great job writing all of the content for his own site and had a good underlying foundation for SEO, but didn’t know how to optimize things properly and needed to focus on his real job, being a family law lawyer. Taylor’s goal was to increase his search engine rankings, but he knew to do that he would need a combination of on page SEO optimization and a campaign to help build his off page SEO. This is one of the most important parts about a website, but one of the hardest to achieve, especially for someone who is also doing their regular job at the same time! Chris had done things right by getting a website built with a solid foundation and waited for the right time for his business to revamp his SEO and up his rankings. Not every business will be able to do both at the same time, as they both take a substantial amount of time, effort and strategy. Many people know that, but for most people it would take a significant amount of time, research, trial and error to figure out how to get worthwhile backlinks. A clue: they are not created equal, and quality is far more important than quantity. Domain Authority from 7 to 21 in 8 months! Normally we do the content creation for our clients, but for Taylor we were just focusing on SEO. We did do some content creation, but everything we created was very focused on getting backlinks and building the authority of the site as a whole. Domain Authority is a metric used by Moz to measure the relative importance of a site on the internet, with a 0-100 ranking. The scale is logarithmic in nature, so it is about 2x as hard to get from 10-20 as it is to get from 0-10. One of the biggest factors in Domain Authority is the combination of backlink quality and quantity, as that is one of the single most important signals to Google about how important your site is on the Internet. Who cares enough to talk about you and how they do it. Page Authority is a similar metric that is used only for individual pages instead of whole sites. 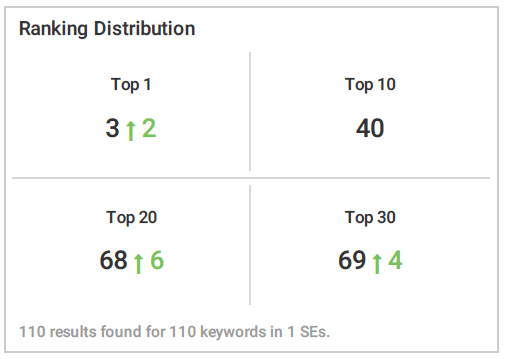 To find out more about these Moz metrics and see how some other businesses ranked you can check out our Jacksonville dentist SEO case study. Let’s say that each page has a maximum SEO value of 1 when it is written and optimized perfectly for that keyword. Every backlink to a given page multiplies the importance of that page by a combination of how important the page and the site are that it is coming from. If a link has enough importance to multiply your page’s importance by 5, wouldn’t you rather your page was optimized at .9 instead of .5? Wouldn’t you also rather get a link that multiplies the importance of your page by 6 instead of 3? That is the power of on page and off page optimization in a nutshell. The numbers are theoretical, but the concept is important. With Domain Authority the numbers are theoretical (Google doesn’t use it), but they are very relevant and important. As explained earlier, the scale of Domain Authority is logarithmic. That means getting to 7 was the easiest part. Getting to 14 was twice as hard as getting to 7 and getting to 21 from 14 was about 4 times as hard as getting from 1 to 7. We don’t actually target increasing Domain Authority, it is just the most consistent measure of overall success of a site. Domain Authority is generally quite slow to change and only changes when meaningful changes have taken place to the backlink profile and your site’s overall importance. Taylor Law is in orange. 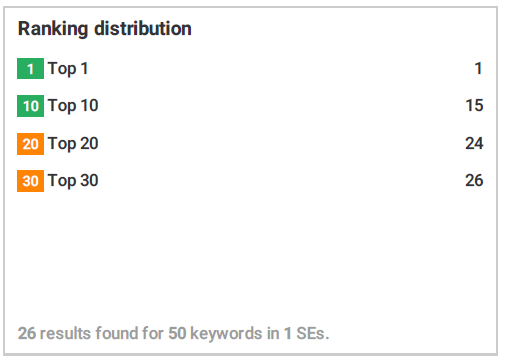 As you can see, Domain Authority and Page Authority actually change so little that our SEO tool doesn’t often scan for them. That is why there are dips between each dot. As you can see, the Domain Authority of the site actually climbed from 7 to 20 between March and July! As you can see in the graph to the right, the Page Authority of the homepage also went up from 21 to 34 during that time. Keep in mind that many of the Law Firms that Taylor Law is comparing against are some of the biggest in Jacksonville both in size and web presence. Lawyers of all types tend to be one of the most competitive areas for online rankings, so getting numerous #1 rankings would take a more concerted content marketing plan than just a site audit and off page SEO campaign.